Setting up or taking down is a very dangerous activity. Incorrect assembly, failing to properly secure screws, tipping over etc. a leg section could slide off and fall when rig is lifted to take it down. the set-up procedure and that DANGERS and safety proceedures..
NEVER have 2 people on a rig set up to over 19 ft. high. especially when setting up to a height of over 16 ft. It is best to have three people. Two people to lift, and one person to insert legs segment while rig is being lifted. 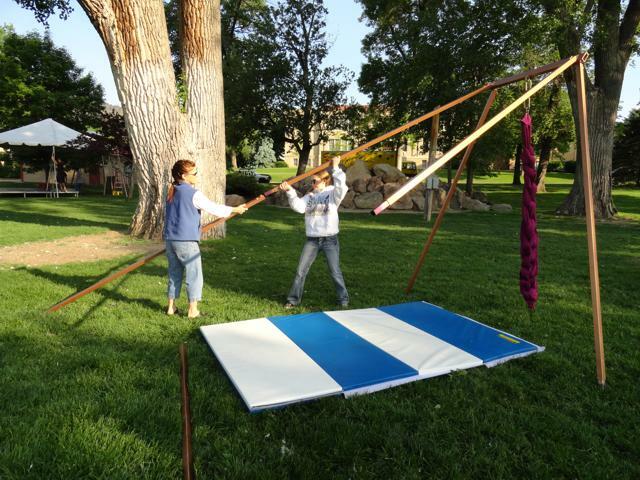 The higher it is set-up to, the heavier it gets and more difficult it gets to set up. We set up this rig for purpose of making this manual. It just took two of us, my friend Alicia and I, and we did it in about 15-20 minutes. 1st few times are slower, but you will get faster after a few times. Setting up the Tri-pod rig is considerably easier. NOT go beyond the legs. Any more swinging than this can make the rig unstable. 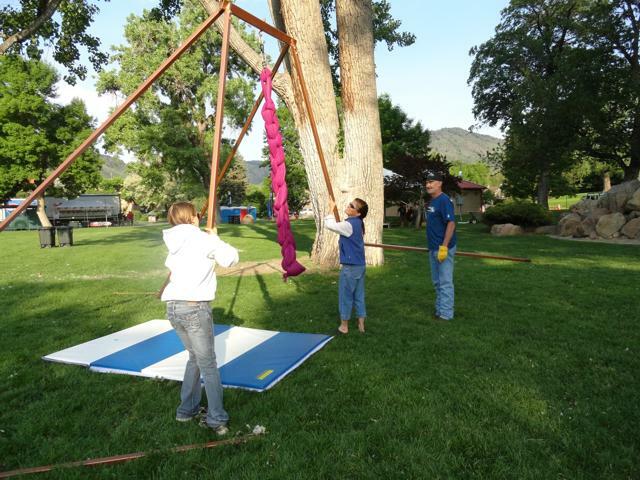 Aerial Equipment and Rigging techniques. following web page about rigging best practices. Learn about rigging before you do it. ALSO putting at risk any other people using or setting up or breaking down. The use of, erection and lowering of a rig is a very dangerous activity. will be used or abused, misused. that the carabineers are not wearing through from use, especially if you use aluminum carabineers..
Or any activity associated with the rig. and should find a more benign activity to participate in. and make sure you understand what is needed to erect the rig. If you have any questions, please call, or write. to get it out of the way, when outdoors where wind is possible. with the old heavy rig. That fabric puts out a LOT of power in the wind. just Daisy-chain it so that it is heavier with less loose fabric surface. Or twist fabric tight and wrap around leg and secure. Even this is not safe in a higher wind. If the wind picks up, Bring it all down and lower the rig. > Switching out apparatus suggestions. > Pulley system ideas for you. Dynamic load SWL= 1200lbs Rolls, soft drops. short bomb drops. Dynamic load SWL= 1000 lbs Rolls, soft drops. short bomb drops. Dynamic load SWL= 800 lbs Rolls, soft drops. short bomb drops. 21ft-ft high, TriPods should never be set up more than 21 ft. Extension feet are just for height options under 21 ft. Dynamic load SWL= 600 lbs Rolls, soft drops. short bomb drops. Most photos in this online manual can be clicked on to see a larger view. Set up Precaution. READ !!!!!! Setting up and taking down the rig is VERY dangerous. You are going to be setting up a 200+ lb rig to over 20 feet high. Anything could happen, be extremely cautious. There should always be a VERY knowledgeable person in charge that is totally familiar with set-up procedure and safety. No one should be setting up a rig if they don’t know how, which includes helpers. BEFORE setting up the next height level of legs. This inspection needs to be done at EACH level before proceeding to the next higher level. If not done at that time, there is no way to check it later because it will be too high to see and check. 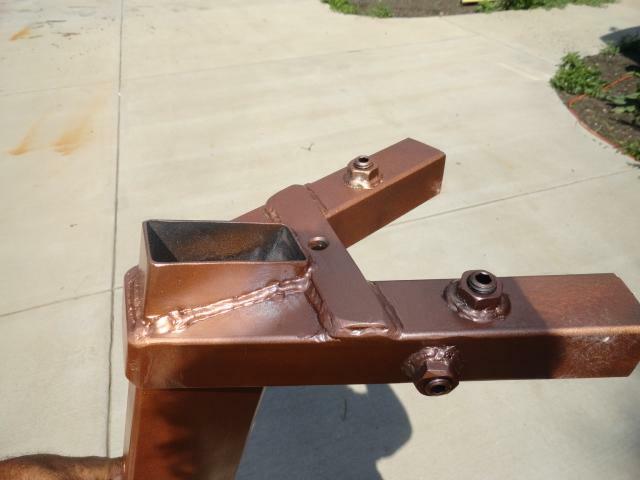 The screws that hold the leg sections in place are for holding leg section snug for less wobble. 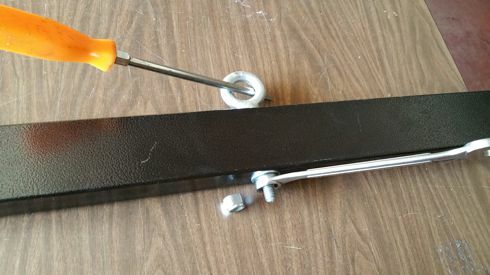 If the screws were not in, the rig would still stand and support and would not come apart because gravity holds them together and the rig would never sustain enough bounce for them to come apart. BUT. 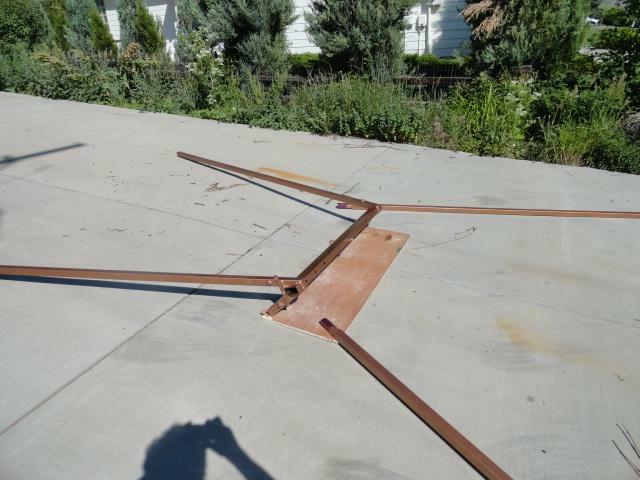 If the screws are NOT tightened properly, or for some reason worked them selves loose, then when taking the rig down a leg section could slip off when lifting the rig on one side to remove leg sections, and could fall on someone. Never lift just one leg to where the other adjacent leg is dangling off the ground. will fall causing injury if it falls on someone. Keep the set-up and breakdown area CLEAR of ALL persons not directly involved in the set-up and breakdown. There are pinch points that WILL BITE you. so that legs are held in by gravity and only come off when you pull them off. then a leg section could slip off when you don't want it too. to header or previous leg section. testing the screws and checking that the snap buttons are ENGAGED. AGAIN: These SET screws hold the leg sections so that they are seated nice and snug into the next leg section's opposing tube wall so that they are nice and SNUG, straight and can't wobble. They also hold the sections in place for when you lift the rig to add or remove leg sections. Be aware of this possibility when erecting or breaking down a rig. Never have people just standing around during erecting and take down. Clear the area of people. FOR OLDER rigs with the 2 set screws per leg section require special tightening sequence. SNAP BUTTONS, that prevent a leg from slipping out when not intended. These joint areas are Pinch points, watch your fingers, Wear non-slip Gloves. HOW TO USE THE NEW BUTTON CLIP. The latest generation of rigs have a snap button to hold legs in place during set-up and break down, This was done because some people seem to forget to tighten the screws properly and leg sections slid out prematurely during set-up and breakdown. .
Just line up the button with the hole in the previous leg section, depress button, slide leg in so that button snaps out and into the hole in the previous leg section. CHECK that the button snapped out of the hole in previous leg section otr header and that the button is engaged and holds the leg section in. These snap buttons are NOT for securing the legs together, that is still the primary job of the screws. This is just a back-up for those people that forget to do it right. If you have an older rig and would like to add the SNAP BUTTONS, Here is a guide on how to do it. and lay 1st set of legs in the location where they will go. Assembly of a Quad leg rig or a Tri-pod type rig is virtually identical. only lift 1 leg at a time to set up vs. 2 legs at a time for a Quad. Now insert the 2 leg section,on one side of quad rig. Tighten set screws and flip right side up. Now lift up the header and insert the other two legs on the other side. Make sure snap buttons engage. Then tighten set screws as described above in "Tightening the set screws" instructions. You now have the 1st level of legs in place. Now is a good time to hang your aerial equipment or pulley system. If you have a step ladder, you can do this after the next set of legs are installed if you wish. 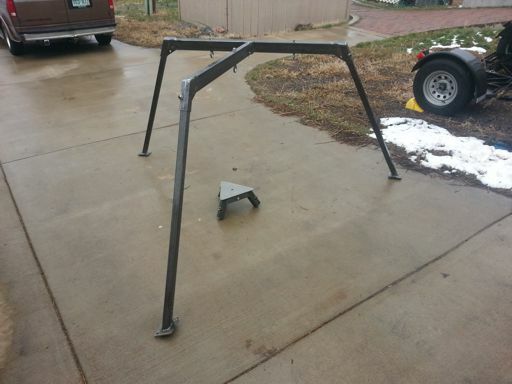 for assembly process for the BIG Break-Down tripod header, follow this link. than the normal small tripod header. this is a good time to clip them to the header's guy wire holes. 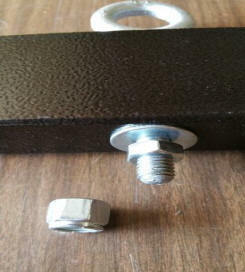 For guy wires this type of screw anchor works well and is available in most hardware stores. at least 18" preferably 24"
DO this before proceeding with lifting and inserting the next set of legs. Failure to do this could cause a leg to fall out as you lift. for ease of grabbing them and inserting them as you lift rig. NOTE how a unsupported leg is DANGLING in air. THIS is NOT the way to do it, 2 people have to be lifting, one on each side. if the screws were not tightened properly. lift 2 legs in air and insert next leg section. Lift one side of rig and insert the 1st two legs for this side. Then tighten set screws as described above. close to its tipping point. Note in photo how it leans. closer to it's tipping point and could fall over. Then tighten these set screws as described above. WARNING, DO NOT lift the rig so high one one side that it topples over. This is especially important on TRIPOD rigs. You can lift them high enough on one leg that rig falls over. You should now have two leg segments installed in each corner of rig. You now have the 2nd level of legs in place. Time to go up another level to the 3rd level set of legs. This is where it gets harder because it is getting heavier. Lift one side of rig, insert the 1st two legs of 3rd level, then tighten screws as described above. Now lift other side of rig and insert 2nd set of two legs of 3rd level and tighten screws as described above. Here we go again, time for 4th level. SURE that they are all properly tightened before lifting. Failure to do this could cause a leg to fall out as you lift. Lift one side of rig, insert the 1st two legs of 4th level, then tighten screws as described above. Now lift other side of rig and insert 2nd set of two legs of 4th level and tighten screws as described above. You are now at about 21 feet high. If you have the optional Extension feet, then you can add those now. These will allow for additional adjusting of the height and for leveling. Your rig is now at it's final height. Time to put on the feet and the chains or straps. 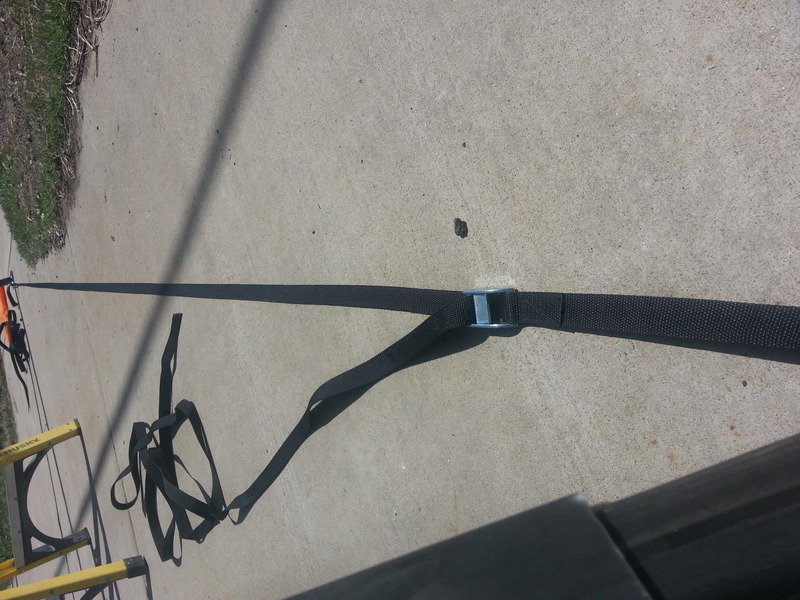 Newer rigs come with straps vs. chains ( some people didn't like the look of chains). The chains or straps prevent the legs from spreading as it is loaded up and being performed on. The chain is one long length of chain, not individual chain lengths. The straps are 4 individual straps with adjustment buckles. This way it can be used for any rig height as the footprint of rig gets bigger as rig gets higher. This chain or straps MUST BE USED. Typically each rig comes with short non adjustable feet, 4 for Quad rig, 3 for Tri-pod rig. You could also have short leveling feet, or optional Height extension/leveling feet. Optionally you can get Adjustable leveling Feet, 1 (for tripod,) or 2 (for quad rig) . 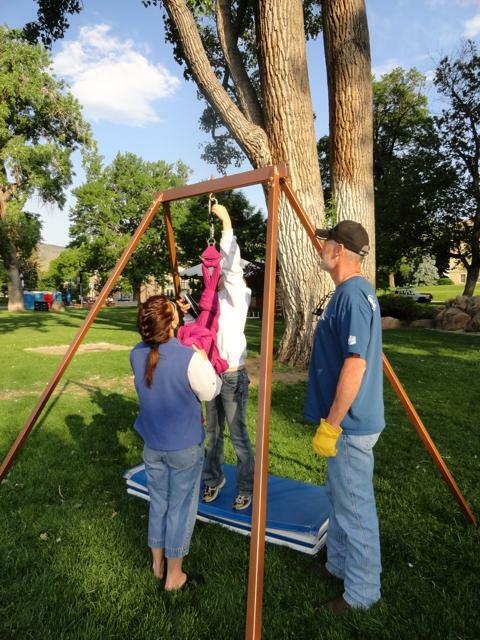 The two sizes of feet are to help with leveling the rig on uneven surfaces. Leveling is only needed if there is significant level difference on the ground. These short adjustable feet are NOT for extra height, just for leveling on uneven ground. Height Extension/Adjustment feet are available also. but are much heavier duty and 4ft long, allowing for an additional 3ft height. This make is easier to adjust height to fit your apparatus or an indoor space. The pins are put in the feet and the legs rest on top of the pins. The set screws on the legs can then Easily be tightened to hold feet firmly in place. short, non adjustable feet, Unless you have the height extension feet, then put pins in holes as needed for height and leveling. This is the short standard non-adjustable foot. 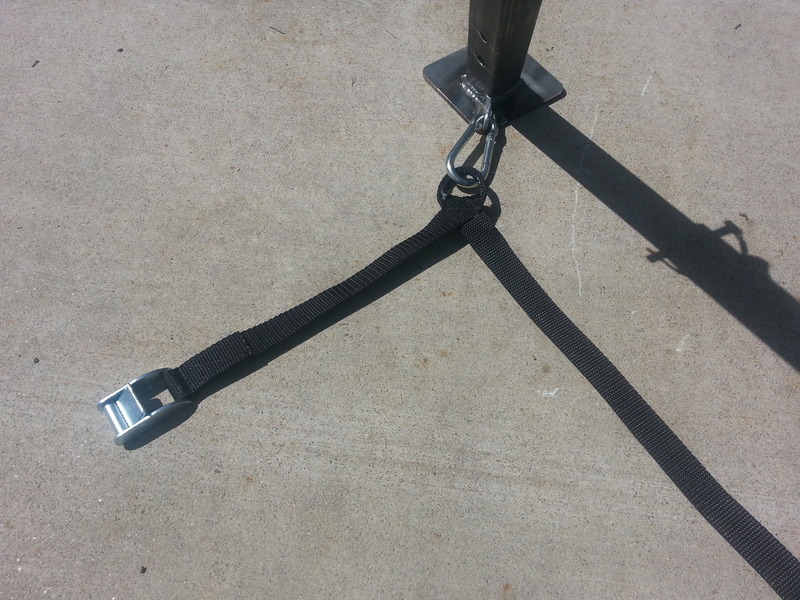 Put the feet on bottom of rig with the carabineers pointing inward toward center of rig. Then tighten the set screws to hold feet in place. Use the height leveling feet, or Extension feet, as needed to get rig close to level. Place the adjustment pins into the holes in the feet that are appropriate for adjustment needed. letting the leg section sit on top of the pin. Do not use rig on surface that is too much slope, IE. more than about 6"- 9" difference from one side of rig to other. to stabilize legs so that they can not slide outwardly as rig is being used. This chain also is used to adjust the location of the feet so that legs are nice and straight, not bowed. Go around to each leg and check that it is close to straight, not bowed. Slide legs in or out as needed to get them close to straight. Final adjustment to get them straight is done as chain or strap is added. Bowed, not too good like this. Straight, this looks good. NOTE, the newer rigs have a hole in the foot. 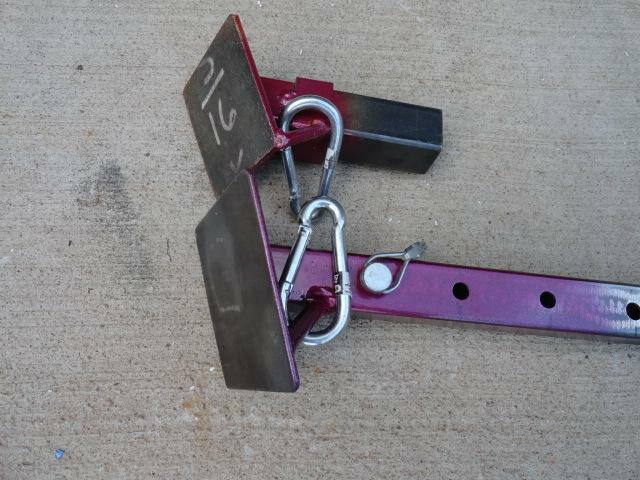 instead of using the chain, you can use a 6" long fencing nail and pin feet to ground. The Chain or STRAP MUST be used (or foot pinned into ground). This prevents the legs from spreading out as the rig is in use and getting bounced. The legs spreading out will cause legs to no longer be straight and reduce strength. it also puts extreme pressures on the leg connection to the header. NOTE, I use chain or strap because every height setting results in a different distance between feet. If I were to use cables as some other manufacturers do, then you would need a set of cables for each height that you set up too. Straps and chain is infinitely adjustable. Start in one corner and clip chain or STRAP to carabineer. Walk the chain or strap around to each leg and lay it there in approx. place where it needs to be clipped in. Working around from 1st leg's foot that is already clipped in, go to next foot. Move leg in or out again to get it straight and clip in the chain or strap. Or put pin through foot hole and into ground. Move on to next foot, slide leg in or out to take out any bow and clip on chain or strap. After doing all four corners, go around again for final straightening adjustments. Move each leg in or out as needed to reduce any bow, adjust the chain. just double clip chain to take up slack. See the little loop of chain by the carabineer! Work your way around from leg to leg and get them as close to straight as you can. This increases the rig's load strength, if legs are NOT bowed. They don't have to be perfect and never will be, just get it close. This will take a little time the 1st couple of set-ups, but will become second nature as time goes by. and chain attached and no slack in chain. Now tug outward on each leg to take any slack out of chain, legs should remain un-bowed. but is straight up & down because of the leveling feet. In this photo you can get an idea of the strength of the rig. I put all my weight on the side of just one leg, it BARELY bowed it out of straight and it easily holds my weight. A performer will be putting their weight on all 4 legs and in straight line of legs not deliberately bowing them out of column loading. will not unscrew themselves during use and drop you on your head. 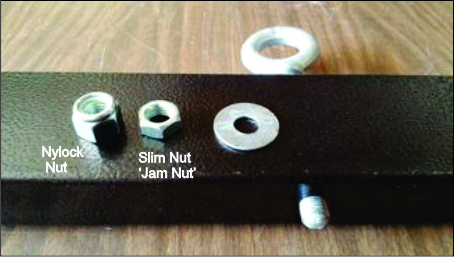 2 NUTS are used, a slim regular nut, and a LOCKING NYLOCK nut. Putting one nut on top of another nut is a way to lock nuts together, I go ONE STEP FURTHER. The second nut I use is a locking NYLOCK which has a nylon bead inside that very tightly grips the bolt threads. 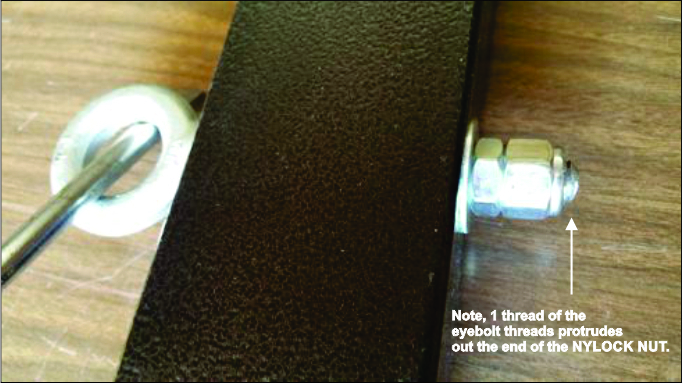 Using the 2 locking techniques locks the eyebolt securely. You MUST use a 'slim' nut as the 1st nut. a regular thickness nut would use to much thread space and then not allow the NYLOCK nut to go on far enough for it to lock. 1st put eyebolt through header then put on the washer. Next, put on the slim non-locking nut and tighten. Make it snug but don't crush the header tube. Use a screw driver to hold the eyebolt so that it does not turn while tightening the nut. Next, Screw on the Nylock locking nut, tighten it firmly against the 1st nut. The nylock nut is properly installed if at least ONE thread protrudes out the end of the nut. If it does not protrude, then it is not on far enough and the nylon inside the nut will not lock onto the bolt shaft. Using my 4" long shaft eyebolt, This is how it should look, if many more threads protrude out end of Nylock, you may be crushing the header tube. In my load testing I hooked the back of my conversion van to the rig using a come-along. Legs had lots of bowing, but held. I then shook the rig with the van rear suspended, still all OK.
load while it was already stressed from high weight on it. After disassembly of the rig I inspected all components for damage or permanent bends and there were none. Legs after lifting back of van. Back of van off ground, note wheel well opening. White strip was slid under wheel to see that van was off ground.